GIS Dynamics, maker of Go iLawn and Go iPave property measuring software, released version 19.4 of its Go iLawn software. Go iLawn 19.4 update includes a 360-degree continuous image rotation, a new overlay of property parcels on map and a new overlay of roads and road names on property map. 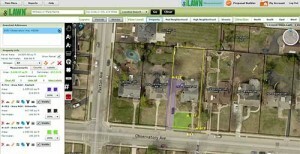 With only one Go iLawn search, users can see the parcels and addresses across approximately 1 square mile of area. “Our new software release lets users see their worksites better and show them from any angle,” said Mike Rorie, CEO of Go iLawn. “It’s just another way Go iLawn helps you estimate better and gives you great visual tools to sell your work and then go out and execute it”. Go iLawn has 100 percent coverage across North America, and it is compatible with Windows 10 and Microsoft’s new Edge browser, as well as Google Chrome and Microsoft Internet Explorer.